Michele Renee Verda, owner of Michele Renee the Studio, is the winner of the 2014 Orlando MyShadi Bridal Expo Facebook Vendor raffle. Desh-Videsh thanks active and engaged vendors like Michele Renee for participating on social media! Learn more about Michele Renee, her charity Water for India, and what inspires her most. For those who are not familiar with you or your work, can you share a bit on how you got started in your business? Well, as the story goes, I started hair and makeup from the crib. I was born in 1975 and everyone [even the men] had long hair as that was the style. So, my mother and my older brother both had long black hair. Being the fifth child and a girl, I was a bit spoiled and only stopped crying when either my mother or brother picked me up. My Mother says it was because I recognized the color and shape of her hair and confused my brother for her! Ever since then, I loved playing with my brothers and sisters hair, watch my Mother put on makeup, and the whole nine yards. When I was in sixth grade, I decided to cut my own hair and cut it so horrible, I missed the first day of school. My love for color and composition continued, and I wanted to become a professional hairdresser, but my Mother (a teacher) wanted me to go to college. During college, I started working for a makeup counter at the mall and never left. Although I did complete college, hair and makeup has always been my passion. I am glad I went to college because those memories will be priceless. But I am glad I followed my heart. How does it feel to be the winner of the 2014 Orlando MyShadi Bridal Expo Facebook Raffle? AMAZING! Raj and Aruna are such forward thinkers. I love how they recognize the importance of social media and the impact on brides and the bridal expo. I am fortunate to be a part of Desh-Videsh magazine! What services does your company provide? Specifically, what wedding-related services do you offer? Michele Renee The Studio provides on location hair and makeup services. 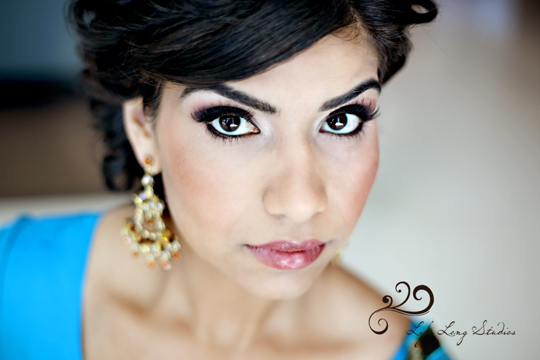 We specialize in camera ready airbrush makeup with lashes. Airbrush makeup can last for hours even through all night dancing! 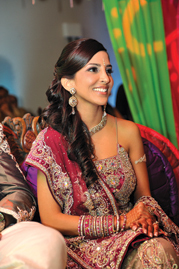 We are able to place the dupatta and clip in your tikka so it isn’t off-center for pictures. With multiple staff, we can handle both the Bride and Groom’s families with ease. 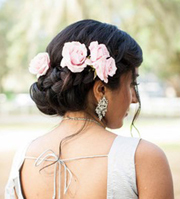 How do you and a new client work together to come up with her look for the wedding or any other event? Before I even start, I like to sit down with the bride and discuss what she likes about each of her chosen pictures. I will also analyze her face shape and the texture and density of her hair. We will eliminate styles that do not fit her face shape or theme of her wedding and form a plan for hair and makeup execution. 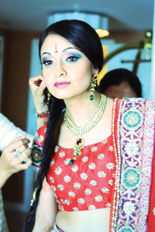 From here, we execute the hair and makeup style by event. I have the bride put on her blouse after the makeup for each event is done, so we can make sure the makeup is appropriate with color context. After each look, I take pictures so I can remember each look. The trial usually takes at least 4 hours, but it is well worth knowing that you will look your best on your wedding day. What is the biggest lesson you learned your first year in business? What was the biggest lesson you learned in this past year of business? Michele Renee The Studio’s main office is in Tampa, Florida. We also have artists in Jacksonville, Gainesville, Ocala, and Orlando. We travel anywhere in Florida or throughout the United States. You are also involved with several charities. Tell us more about your latest endeavor, Water for India, and how you came to be involved. This is my baby, I love this charity! It is so close to my heart. Sometimes when I go shopping and want to buy a pair of shoes, I stop myself and think about how many wells I could sponsor instead. Needless to say, I only wear neutral shoes that go with everything! On a serious note, I fell into Indian weddings. I was born in Texas, where being brown means being Mexican like me! When I moved to Florida, I felt at ease with the Indian culture. Like me, they are brown, love music and dance, and are very close to their families! There is nothing I don’t admire about the Indian culture. Most of all, I respect their religion. Recently, I was admiring my friend Kresha (owner of Traditions Boutique), who is Jain, during a photo shoot. She was fasting, and yet, she was still working and running around on set. As a Christian, we do fast, though it is not normally practiced. Personally, I could never fast during a photo shoot, but as I told my friend, I could learn from her devotion and dedication to her beliefs. And so, since I love everything about the Indian culture, last year I wanted a Bollywood-themed birthday party. I met with my two friends from Two Ladies and Events (wedding planners), Seema and Megha. At that moment, I felt “rich” in my life. Though I am not wealthy, I am happy, love my job, have good friends, and a healthy Mother – there was nothing else I wanted. That said, I did not want or need gifts. So, as we bounced ideas around, I looked at my beautiful Indian friends and realized that I am so blessed that the Indian community has welcomed me and supported me in my business. I wanted and needed to do something for the community. Thus, Water for India was born. We are in our second year, and we are raising bore wells for CERDS. We’ve raised even more this year, and it feels really good to know that even though I am not a millionaire or even a thousandaire, I am still able to do good for someone else. What has been your favorite wedding or moment that stands out to you and why? There a million moments that I love! I literally cannot watch a wedding, even a stranger’s, without crying. My favorite wedding moment has to by Roma’s. She was a trooper. She went to sleep around 1 am and woke up at 2 am for hair and makeup. Since she only got one hour of sleep, she could not keep her head up for me. I had to find a solution for this poor girl, so I wrapped some towels around her neck, put her in a sofa chair and propped her feet up – she slept while I did her hair and makeup! In the end, I got a rested bride with hair and makeup. What suggestions do you have for couples planning their wedding? If someone comes in and wants their hair and makeup perfect, I tell them well you don’t want me because I am not perfect. The only thing that is perfect is Our Creator. Besides, life isn’t perfect. That is the beauty of it. Without all the little oopsies during a wedding, it wouldn’t be a wedding, it wouldn’t be interesting, and it wouldn’t be life. And isn’t life in the end really wonderful?